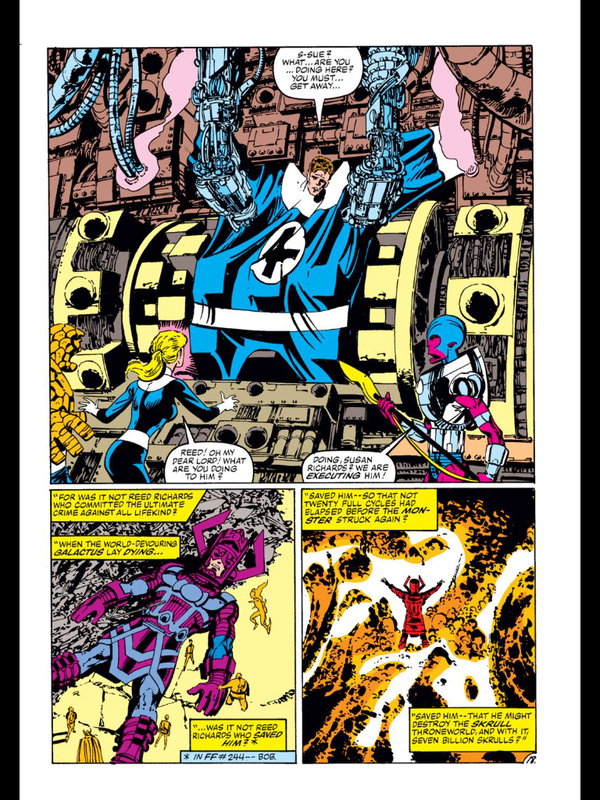 John Byrne cemented his legend when he took over the Fantastic Four with # 232 and most of his run was solid superhero stuff in the fashion of what Lee and Kirby had established before. Arguably his finest hour on the title was this 3 issue arc where Galactus is too hungry to seek any other planet than the one he once vowed to spare. 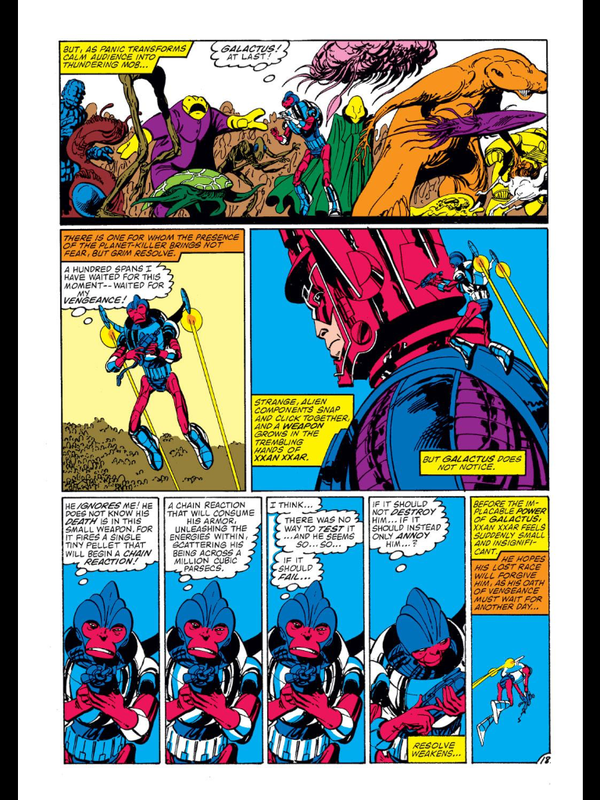 What ensues is a Terrax ( his Herald) betraying him and trying to force Reed and the others to kill a weakened Galactus. The threat is so large, that this time, the Avengers and others getting involved for the first time in repelling his attack. 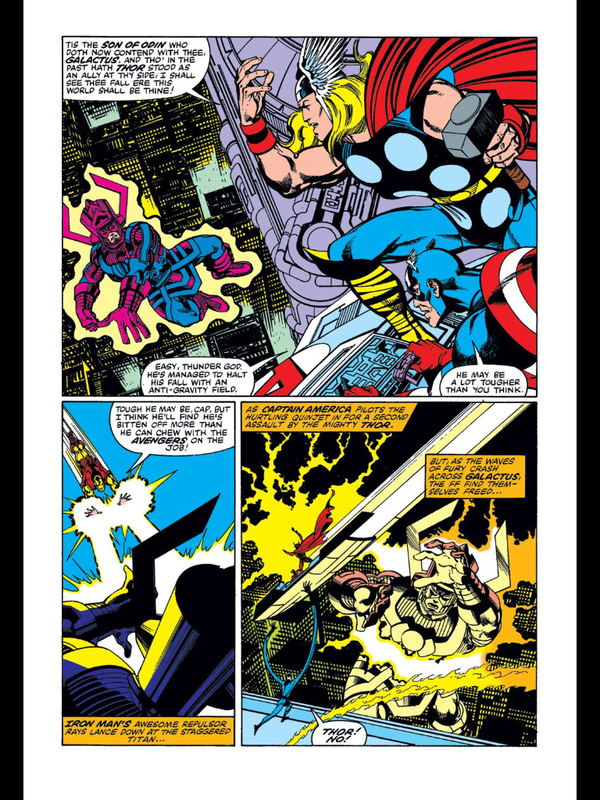 Just solid action with a controversial ending because Reed chooses to spare his life when he’s at deaths door. 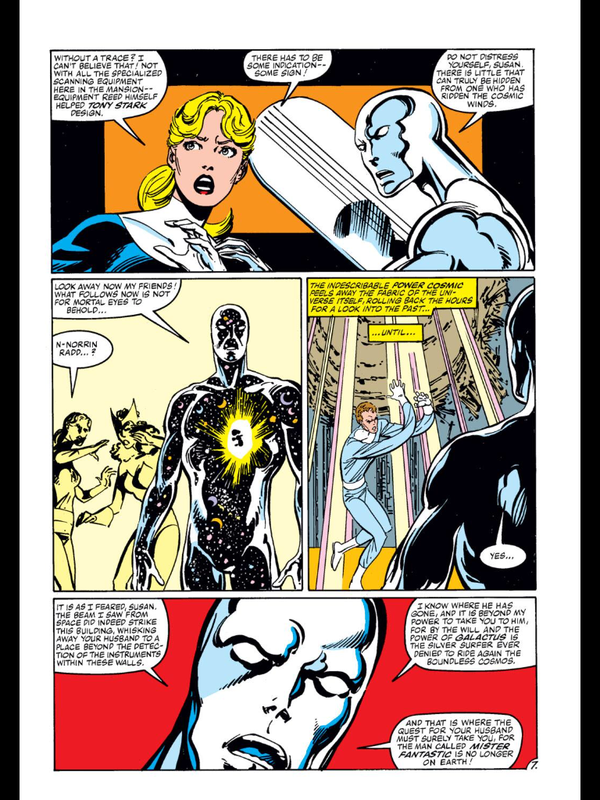 This decision works as a springboard to another future story which I have included as part of this saga, the Trial of Reed Richards # 261-262. 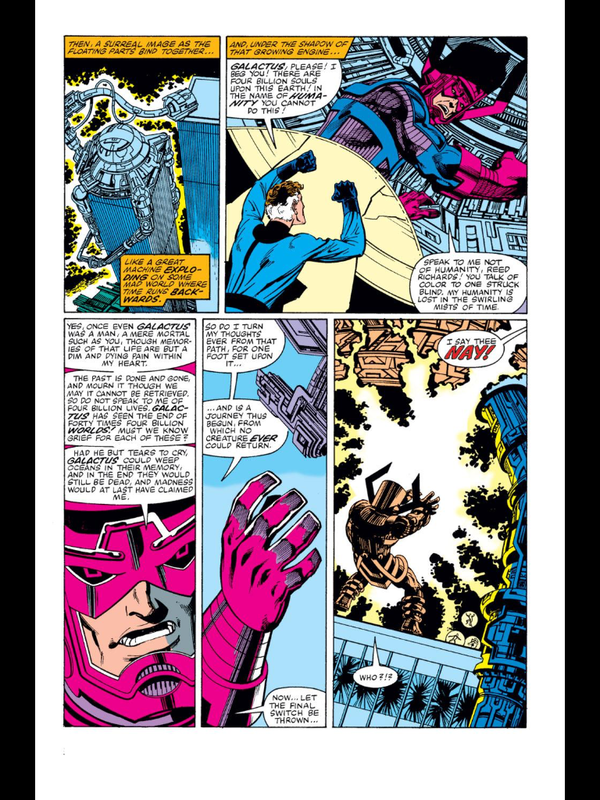 The Imperial Shiar abduct Reed to answer for allowing Galactus to live in spite of his murdering millions in his existence. The only thing that tarnishes this story is that Byrne writes himself into the conclusion. Otherwise a great story that I intend to re-read once I stop typing this. I really wanted to read this, and I have tried to do so 3 times now, but the art is just so horrendous I just can't. Clearly that's not the focus, but there should be better than boxes with stick figures in them, IMO. Alot is said about the Pinis and their self-publishing, but I think not enough gets said about the actual comic, which is really quite good. 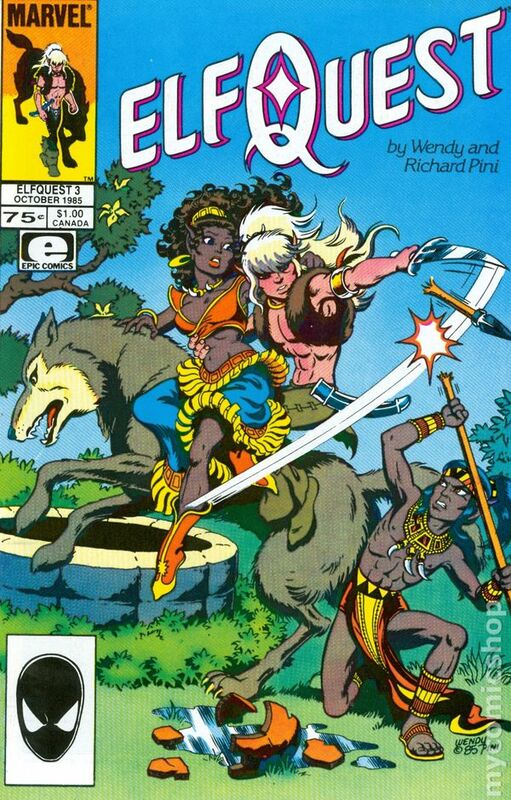 The original epic (as well as the first couple follow up minis) really had everything you could want in a fantasy series... great characters, good action, awesome art... 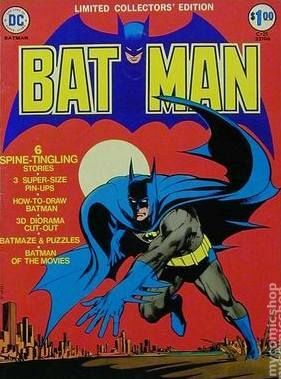 I bought the first few issues of the original series in the back issue bins on a random slow Wednesday back in the day, and went back to the store the next day to get the rest (happily, they were all there, and for cover price, too). I'll admit the recent stuff almost seems like fan fiction in it's constant teeny bopper fan service twists, but back in the day, you couldn't find a better straight fantasy. Could you be specific as to exactly what issues that includes? Prevents a lot of contention later on and saves me a ton of clerical work when I'm tabulating results. The entire run from Marvel Epic, which is 1-32. Sorry, thought that was clear. This was a treasure when it came out. 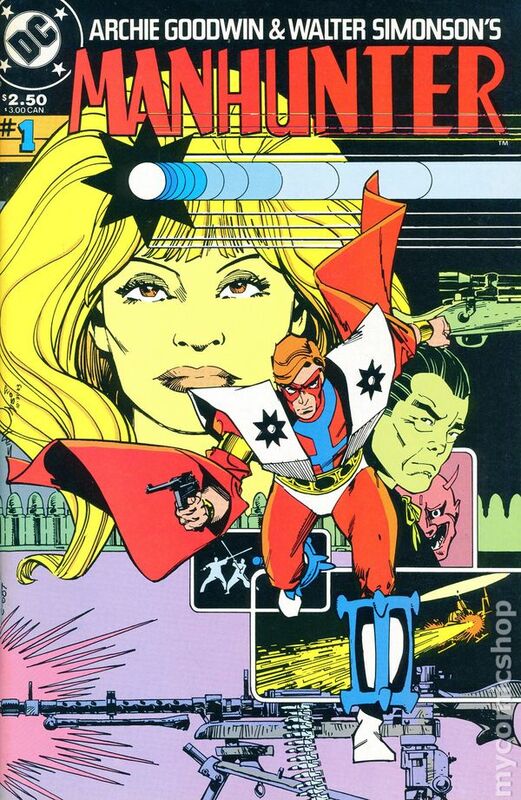 I had a handful of Gold Key's Solar & Magnus & when Valiant launched with updates of these characters I was hooked. And it still holds up today. I just re-read some early Valiant last year & it's good stuff. Saves me looking it up, which gets to be a lot when you multiply by 10 days and multiple members. And sometimes what's included does get contended. I have no idea, for example, if the Epic run reprinted the entire original series. If not, do you include the non-reprinted original stories in your nomination or not? Were their mini-series that you include in the list? Probably not, but listing the specific issues prevents any chance of contention regarding this. Amazing series. I remember it fondly when it was the back up in 'Tec. Gotta love those sleeves & boots!! This barely missed my list. Alan Moore, Neil Gaiman, Gary Leach, Alan Davis, Chuck Austen, Rick Veitch, John Totleben, and Mark Buckingham. I'd been getting comics directly from the States for a few years on and off, as finances allowed(feeding a car, a burgeoning beer habit, and the occasional girl drunk enough to let me tie her up, tends to curtail comic buying) and had been trying to expand my horizons, comics not drugs fool, when I came upon Miracleman 3 with its ugly little cover. But what a story, I've always had a soft spot for writers who are able to turn a worn out idea around, and I wasnt let down here. Of course it all turns out so much better than just another Elseworlds tale of Shazam. Love the choice. It would really help simplify the tabulation process if you could include the exact issues you are nominating, though. Thank you! I can see Spiegelman's art not being for everyone, but I'd hardly call them stick figures. I actually think the art style is perfect for the story. Almost anything more "commercial" would detract from the gravity of the story. I suppose stick figures is a little unfair, but it's just so lifeless.. maybe I'd get into it if I read it, but I just wasn't able to do so. 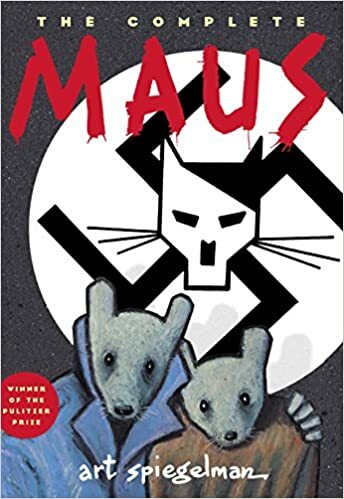 One of the themes of Maus concerns the unwillingness of those who weren't there to fully engage with the horrors of what transpired. The simplicity of the art addresses that to an extent. It's easier to engage a cartoon mouse being persecuted by cartoon cats than looking at a detailed Joe Kubert depiction of realistic looking people being tormented by other lifelike people who are only different because they wear a uniform and sport a gun. Knock off the eye-rolls, kids! I know, I know… these are issue-of-the-month morality plays replete with ladlefuls of leftover 60’s liberal pieties, overtly obvious analogues and a tendency toward preachiness. 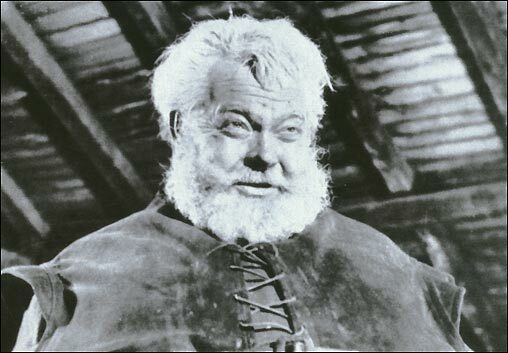 HOW-ever, I’m going to have to pull rank and haul out the old, “Ya hadda be there” response. and of course, drug addiction – readers like me were first stunned and then elated. “Readers like me” were teenagers who had been set adrift by the sea-change that had begun with the JFK assassination. Thanks in large part to the power of the press, much that we had taken for granted about our country and our culture had been exposed as hollow pretense and we found ourselves on the other side of a deep divide. Realizing that you’ve been lied to, or that you just hadn’t been paying attention, made “readers like me” that much more receptive to O’Neil, Adams and their four-color pilgrims’ progress. To see two DC heroes, who were so “establishment” that they made the Anderson family in “Father Knows Best” look like the Manson Family, and particularly two than whom no one had been stodgier, hit the road Easy Rider style to “look for America” was mind-blowing, if I may use a quaint expression. Read it as a story created in reaction to a tumultuous time and you can forgive at least some of O’Neil’s ham-fisted characterization and melodramatic missteps. Adams’ art, though, is less of its time; in fact, I think it far outshines most of the work he's done in the years since. In Green Arrow’s facial expressions, he captures perfectly the anger and frustration many readers felt; in Green Lantern’s face and body language, he caught equally well the sense of bewilderment and disillusionment others felt at noticing “The Man” behind the curtain. 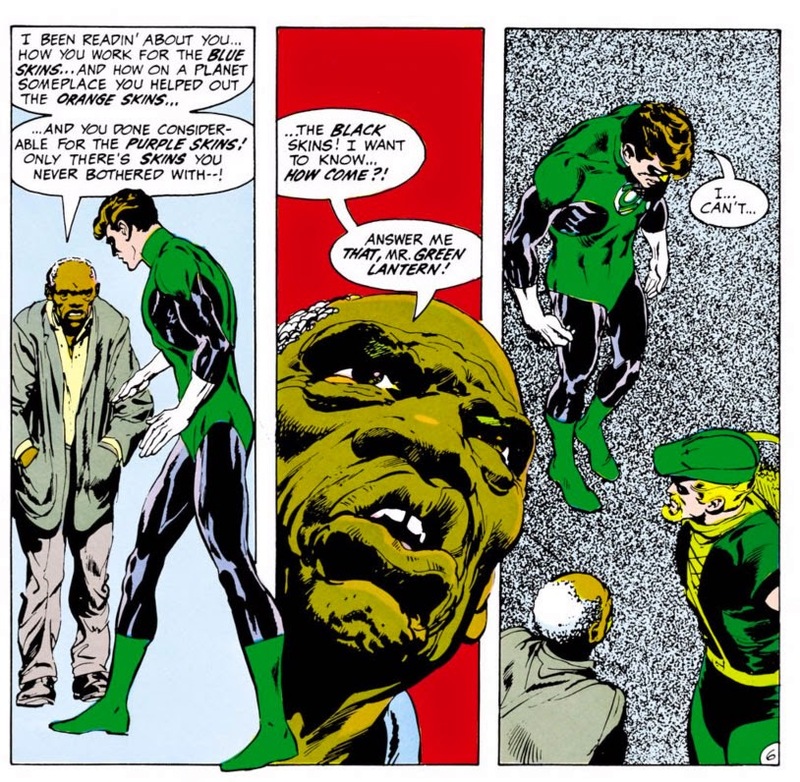 And I still think that the old black man, forever, ironically, and appropriately nameless, who confronts Green Lantern so simply and so eloquently is one of the greatest of all comic book characters. I loved those issues then; I respect them now. PS: "Hard-Traveling heroes" was NEVER the name of this saga. That's the bogus allegedly hip name they gave the reprint collections.